Since the launch of oil production migrants have settled in the historic city cores of Gulf cities due to the move of local populations to new suburban neighbourhoods (Nagy 1997). The rapid shift from compact vernacular desert settlements to motorized cities characterized by urban sprawl led to a strong separation of historic city cores and new urban expansions. Steadily, historic cores lost their importance due to out-dated infrastructure and rather limited accessibility. This was parallel to the move of main retail centres towards the urban periphery and the newly urbanized areas. While shopping malls on city outskirts began to cater to higher income groups, the mixed-use central areas accommodated the various services and shops for migrant communities leading to a relatively distinctive economic environment with direct exchange and interaction between groups with lower income (Salama and Wiedmann 2013). Most migrant communities residing in historic city cores have been from the Indian Subcontinent (e.g. India, Nepal and Bangladesh), South-East-Asian (e.g. Philippines) and Middle Eastern (e.g. Egypt, Jordan and Sudan) origins (Gardner et al. 2013, p. 4). In addition to a large percentage of migrants, who only dwell a limited number of years in Gulf cities without their families, a stable and growing community has remained from the first generations of migrants who decided to settle after the oil production commenced. Both the settled and the continuously exchanging majority of migrants have created distinctive neighbourhoods and particular ways of urban life, induced by their own cultures (Nagy 2006). The contemporary street life in downtown areas is thus an expression of a large part of the overall population of Gulf cities, who have experienced an increasing struggle to be heard and to be integrated within today’s urbanism (Gardner 2011). In most recent years, downtown areas have begun to attract a new dimension of investment interests in real estate due to their central location and the still existing built heritage from the pre-oil era, which was rediscovered by decision-makers as an important factor for attracting new businesses and tourism as well as establishing general urban identity (Salama 2014a, 2015). Large-scale projects, such as Souq Waqif and Msheireb redevelopment in Doha or Bastakiyah in Dubai, have led to an urban transformation process instigating gentrification and leading to higher rental rates and a subsequent move of lower income migrant communities to urban peripheries (Wiedmann et al. 2013). This gradual replacement of communities, who have had a significant impact on these urban spaces for decades based on their daily needs and cultural backgrounds, will subsequently lead to the end of a significant element of contemporary Gulf cities rooted in long-term migration characterized by a particular spatial-economic structure and a high level of spatial diversity. While the study presented in this paper is undertaken based on a Western understanding of the contemporary city; its urban environment and dynamics, the interest in Gulf urbanism is increasing as evidenced in the growing body of knowledge which ensues from various disciplinary perspectives and aims to provide insights into the relationship between various communities and the urban settings they use (Nagy 1997, 2006; Gardner 2011; Sulayman 2010; Mohamad and Sidaway 2012; Salama et al. 2013a, b; Elsheshtawy 2013; Kamrava 2016; Evren Tok et al. 2016). In essence, our aim is to investigate the everyday urban environment of migrant labourers in order to identify key characteristics of a neglected and ignored aspect of contemporary urbanism in Gulf cities. The recent urban transformation has led to few last remaining urban spaces, where the spatial practices of lower income migrant communities can be observed in historic and central urban areas. Most of these low income groups have been moved to labour camps in industrial areas and in far distances from urban centres. The paper is thus an important contribution regarding the contemporary research on Gulf urbanism. The Al Asmakh district is selected as a case study that represents Doha’s traditional urban core and that faces major transformation processes in the near future (Fig. 1). A review of a number of concepts provides a theoretical reference for understanding the notions of ‘everyday urban environment’ and ‘socio-spatial practice.’ These concepts emerge from disciplines and areas of interest that include environmental psychology or environment-behaviour studies, new urbanism and sociology. Within the field of environment-behaviour studies. Amos Rapoport argues that the physical elements of an environment are of direct influence on the relationships and activities that happen within them (Rapoport 1990, 2005). The built environment is thus both a force defining human movements as well as a result of the overall human spatial practice in one place (Sanoff 1974). The long-term relationship between actual residents and their surroundings will inevitably lead to a spatial expression of the social structure and eventually to a representation of their various needs and preferences as community or a group of individuals who share a substantial number of values. Everyday urbanism is a concept that has been widely theorised in contemporary literature (Chase et al. 1999; Goonewardena, et al. 2008; Edwards and Charley 2011) with three main qualities: it is portrayed as non-utopian since it capitalises on the everyday reality of ordinary life with little or no interest in debating the ideal built environment; as conversational since it incorporates multiplicity and simultaneity with openness to populist or mainstream public informality, and as non-structuralist since it softens the relationship between the designed environment and the socio-spatial practice of users (Kelbaugh 2000). In the context of discussing everyday urbanism, reference should be made to the ‘conceived-perceived-lived’ triad of Henri Lefebvre. In this respect, conceived space is based on decisions made by the public sector exemplified by practitioners, decision-makers and others who are in a position to impose their personal notion of ‘order’ on the concrete world. Perceived space represents the interactions between people and institutions: the space where movement and interaction take place and where networks develop and materialise. Lived space, which represents our focus in this programme, is the way people actually live and interact with their environment; the direct unconscious, non-verbal relationship of humans to space. Everyday urbanism describes everyday life as a receptacle of all types of meanings that range from the ordinary to the extraordinary (Lefebvre 1991; Purcell 2002). It focuses on the everyday environment of the activities of the public while exploring the typically oversimplified domains of daily existence as a crucial field in contemporary culture (Harrison 2007). It involves shifting from the elite decision-maker and the egoist/pragmatist professional architect-planner to the enabler-architect and the ordinary layperson. ‘The right to the city’ is another concept that was originally coined by Lefebvre as a responsive appeal for a new and radical kind of urban politics; it is currently in widespread discussion and usage, particularly in more political-activist contexts. In his essay ‘The Right to the City,’ Harvey rearticulated Lefebvre’s core belief, arguing that “the right to the city is far more than the individual liberty to access urban resources: it is a right to change ourselves by changing the city.” (Harvey 2010: 315). Rooted in imagination, the ‘lived space’ is essentially subjective, a passive experience wherein the outer physical space resonates with the inner imagination, which makes symbolic use of outer objects, retaining or rejecting them according to an arbitrary, because subjective, though often cohesive system of priorities and preferences. Specific locations within a given vicinity can, for example, become focal points, familiar attractions, or environments that are significantly attached to. This is due to their position and status within the lived space of a particular community of people who use that vicinity—a mosque, a graveyard, a square. Corresponding with the views of Rapoport and Sanoff, the public realm of urban spaces can express the inner relationships between inhabitants and their built environment by being either used or abandoned. Thus, Lefebvre (1991) argued that the complex relationship between inhabitants and existing urban spaces will lead to another evolutionary chapter within urban development patterns due to the rising public opinion and the subsequent resistance to top-down decision-making. This view was further reinforced in the environment-behaviour and community planning literature (Sanoff 2000). Yet, the realm of environment-behaviour studies took a different turn expressed in the systematic examination of human behaviour as it relates to the everyday urban environment. Human behaviour is thus a clear indicator of whether urban spaces are important factors in everyday life or if they are rejected and avoided. While the absence of any street life can have various reasons, such as security concerns or introverted lifestyles rooted in cultural particularities, the actual activities can be observed and evaluated to gather in-depth insights if public urban spaces are perceived as attractive or repulsive surroundings. Subsequently, urban spaces can be identified as either key centres inviting a wide range of social groups to interact or as segregated spaces with limited access to any form of social inclusion and thus often abused and neglected (Burgess 1925; Altman 1975; Whyte 1980; Gehl 1987; Mitchell 1996). Primarily, behavioural studies need to be integrated with various spatial analyses of the local built environment, its historic roots as well as its various components in order to gain insights into the particular factors that lead to the complex social-spatial practice of a specific community group. The Al Asmakh district is part of the traditional settlement area built before the oil production commenced during the late 1930s (Al Buainain 1999). The district covers an area of approximately 30 ha and it was originally used as a residential area encompassing a number of traditional neighbourhoods, known as fereej. The vernacular built environment was a direct expression of the local climate and culture. The small port and the main market, known as Souq Waqif (the standing market), were easily accessible for all inhabitants leading to a distinctive main road structure, which was defined by the general wind direction to enable the natural cooling of the district (Hasanin 2007). The building clusters were formed by courtyard houses in various sizes expressing the traditional emphasis on privacy as well as the need to use land along the coast as efficient as possible to enable access to the few water sources along the dry riverbed (Fig. 2). Due to the emerging pearl trade, which has led to the first phase of migration at the end of the nineteenth century, Doha has witnessed a fairly early diversification of its population. The migration of merchant families from India and Iran as well as East-African slaves led to various social groups living in segregated areas. This first migrant generation was granted the Qatari nationality once Qatar declared independence in 1971 (Fromherz 2012). The main transformation process however was initiated by the oil production, which began in the 1940s and led to a rigid and extensive modernisation period (Salama and Wiedmann 2013). The first modern infrastructural networks were planned by Western consultants and built by South-Asian labourers. The first schools were established and teachers from Egypt, North Africa and the Levant settled in Doha. The rapid urbanisation led to the end of desert and nomad communities while the rise of Doha as a capital city instigated a concentration of all major infrastructural developments in the new capital (Remali et al. 2016). The move of the local population to newly built suburban districts, which offered the best infrastructural supply and the ability to use imported cars as the desired mode of transportation as well as a highly increased private living area per person, led to the subsequent move of migrants to the traditional neighbourhoods, such as Al Asmakh. In many areas, the traditional courtyard buildings were replaced by multi-story apartment buildings as well as one-story commercial enterprises (Nagy 2000). The first zoning efforts inhibited the spread of commercial land-use, which has only been permitted along the main road grid (MMAA 1986). Consequently, the inner district’s residential layout was mainly preserved. The limited access by car also prevented higher urban densities and thus a substantial part of historic buildings was kept intact during the various phases of modernisation. The lack of investment in new developments however led to a state of continuous deterioration. Since the end of the twentieth century, a new development vision was introduced in various realms to transform Doha into a regional hub city. Large-scale public investments led to rapid urban growth and thus new migration patterns. While the construction boom caused the move of significant numbers of construction workers, mainly from the Indian Subcontinent, the real-estate associated services and the newly emerging economies led to the arrival of new migrant groups with medium to high income from different parts of the world. These new potential tenants led to a relatively new phenomenon, the introduction of housing for higher income groups in the city core. The first development step to revitalise the traditional core of the city was the reconstruction of the Souq Waqif in 2004, which was opened in 2006. This well-received project led to the creation of a new leisure and tourism centre and thus a rediscovery of central urban areas as key urban spaces representing Doha and its cultural roots as manifested in the built form and fabric. The next step was the launch of the Msheireb project, which has been developed on a more than 30 ha of land in the North of the Al Asmakh district (Fig. 3). In order to develop a large-scale mixed-use project with state-of-the-art infrastructure, the entire historic building substance as well as the previous road grid was demolished (Law and Underwood 2012, 2014). Subsequently, all former residents had to move to other districts and the long-term spontaneous evolution of the Msheireb district, as a representative of traditional neighbourhoods and their migrant communities, was replaced. In recent years, various initiatives have been launched to redevelop the Al Asmakh district. While the Msheireb approach was followed in many aspects due to the introduction of large-scale master plans, a certain level of preservation initiatives was integrated. Nevertheless, the future upgrading of the district will inevitably lead to the move of migrant communities due to the expected rise of rental prices in central and well accessible areas (Colliers International 2014). Due to the narrow streets and the complex land ownership by a large number of landlords most inner district areas of the Al Asmakh district have however not been replaced yet by modern developments and a large amount of historic residential buildings, which are part of Doha’s small architectural heritage, can still be found. The lack of modern infrastructure in combination with the missing investment in the building substance led to further deterioration. This deterioration is visible in form of run-down facades as well as entire buildings, which have collapsed and cannot be inhabited anymore. The Wadi Msheireb Street in the North has become an important investment focus due to its role as the main urban artery to large development sites, such as Souq Waqif and the emerging Msheireb project. The Al Asmakh Street is another key access road since it links the A-Ring Road with the historic core. Abdullah Bin Thani Street is the main inner access road separating the district in two main areas. Due to the concentration of services and commercial developments along the main road grid, which provides a certain level of accessibility by car, the inner residential areas have remained densely built with hardly any public realm. The main public spaces in these inner district areas can be found in form of street corners, along pedestrian areas and in the surroundings of small mosques. Cold stores, barber shops and small cafes have settled along these sites in order to serve the local residents. Office workers hardly visit these inner district areas and the high level of isolation led to an almost parallel urban environment within these densely built and populated neighbourhoods. 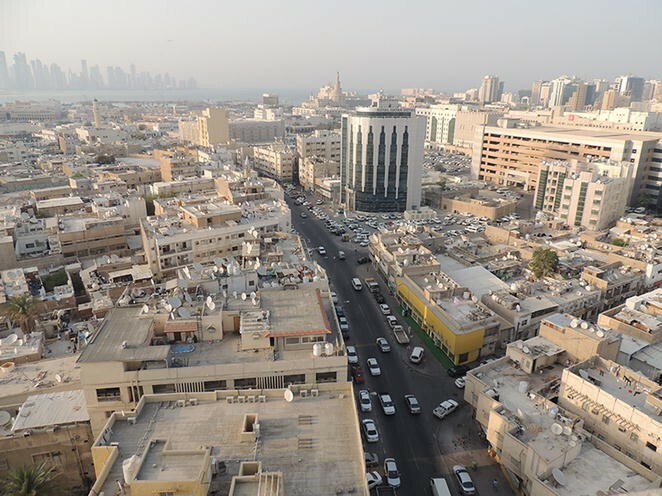 This segregation has led to rather differing perceptions of the overall population regarding these residential areas within Doha’s historic centre. While many labourers and other migrant groups, who have settled in Doha for decades, have been experiencing these neighbourhoods as an everyday urban space and main local identity, most high-income groups and recently arrived migrants lack any personal relation to these essential parts of Doha. The main exception are locals, who often own properties in Al Asmakh or similar districts and who associate these urban areas with their ancestors’ neighbourhoods and the first phase of modern urbanization, when most commercial activities were still concentrated in Doha’s historic core (Salama and Wiedmann 2016). According to the Ministry of Development Planning and Statistics in 2010 and 2015, the number of inhabitants currently residing in the Al Asmakh district has dropped from 4128 to 2086, of which almost 94% are male (MDPS 2015). The big dominance of male residents is a clear sign for a large percentage of labourers, mainly from the Indian Subcontinent, engaged in construction or in other low income sectors. These migrants are not permitted to settle with their families in Qatar and their contracts are usually short-term (Gardner et al. 2013, p. 4). In total, there are 264 buildings, of which 251 are currently used. Due to the fact that there are only 432 apartments/units, there is a high occupancy rate per housing unit and labourers as well as most migrants usually share accommodation. The high urban density and the lack of living area per resident have led to a rather extensive use of the urban space/outdoors. The low income of residents and the lack of higher income groups visiting the area have resulted in that integrated commercial services are reduced to minimum needs and demands. The resulting economic activities have thus led to very particular spatial conditions and a strong differentiation between main roads and back-sided inner district areas. The methodology was developed as part of the elective class ARCT 420: Environment-Behaviour Studies, offered to fourth year architecture students at Qatar University. The class adopted the theoretical underpinnings outlined above with a focus on the conjecture that the built environment is not simply a background against which human actions take place, but reflects and shapes human assumptions, beliefs, feelings and behaviours. Coupled with the typical format of delivery of lectures and presentations, the class offered a series of in-class and out-of-class exercises and assignments that employ various learning styles which prepare students to a more comprehensive structured learning experience in the form of a group research project. Entitled “Understanding the Socio-spatial Practices of Migrant Communities in the Traditional Core of Doha,” the project was an endeavour to learn about the dynamics of those communities in relation to the everyday urban environment. Migrant communities have established ways to integrate their immediate needs in urban spaces or residential buildings despite public monitoring and licensing. The lack of public realm and leisure spaces has led to the use of the ‘in-between’ spaces and un-built sites such as, for instance, the establishment of informal cricket fields in parking spaces, or the use of a sidewalk or a street corner as a social space. Functional Attributes: Diversity of use; environmental responsiveness; appropriateness of form in relation to use; contextual accessibility; diversity of gathering nodes; visibility and inclusion of iconic elements; clarity of edges and boundaries; quality of architectural and landscape elements; adaptability and opportunities for appropriation. Social Attributes: Promoting effective user experience; social inclusivity; engaging diverse social groups with space; accommodating diverse social activities; promoting interaction among different social groups in terms of age, cultural/ethnic background, or gender; serving different social groups in terms of food option and landscape elements; and social accessibility in terms of location and transportation options. Perceptual Attributes: Human experience; comfort and relaxation; personal space and privacy; safety and security in terms of boundaries, availability of security personnel and cameras; memorable architectural character; signage system; navigation and movement; spatial experience; reflecting local identity; and attractiveness. Each category involves checklists with a scoring system. Checklists are phrased in the form of questions underlying each category. Questions are designed in a manner that reflects the essence of each attribute. Numerical scores are assigned to the questions to represent the degree of appropriateness using four-points scale where 1 represents highly inappropriate and 4 represents highly appropriate. Scores are averaged and an overall score for each urban space is then calculated. Concluding observations-based comments together with supporting illustrations are developed, while highlighting positive and negative attributes in each space. In order to ensure objectivity and reliability, students were requested to conduct the assessment individually and collectively. The second tool was direct observation and behavioural mapping; systematic methods for describing what users of a space actually do there. This is a direct approach that aims at understanding the dynamics of people and their interaction with the urban environment; it views people as ‘objects’ by recording their periodic behaviour. Valuable information can be obtained when behaviour is systematically recorded (Sanoff 1991). Unplanned observation may result in inadequate findings that may reveal only what seems to be already obvious. Systematic observation of behaviour involves four aspects: people, activities, setting or space and timing. In this research, a combined unobtrusive mapping technique, which integrates ‘place-centred’ mapping and ‘individual-centred’ mapping, is used. Place-centred mapping aims at observing actions in a particular setting or portion of a public space; these are recorded on floor plans, maps or diagrams. Individual-centred mapping records the tasks, activities, and movements of people throughout the investigated space: it represents a systematic learning about a particular group of individuals whose activities are distributed throughout a specific period of time (Salama et al. 2013a). The studies aimed at the documentation of different migrant communities’ behaviour within various lived urban spaces in the Al Asmakh district. A number of criteria were examined to distinguish between public spaces in street corners and along streets and to understand periodic behaviour during week days and weekends as well as in afternoons and evenings in order to detect key characteristics about the dialectics of migrant communities and their everyday urban environment. The application of the ‘Walking Tour’ assessment procedure reveals key characteristics relevant to the functional, social and perceptual attributes of the urban environment in the district. The functional attributes of key areas within the district included the analysis of land-use integration in the two streets: Wadi Msheireb Street and Al Asmakh Street (Figs. 5, 6). In both cases, land-use integration can be regarded as sufficient due to the earlier zoning plans permitting mixed-use developments along all main access roads and establishing the integration of basic services and commercial activities. While the general accessibility to the key areas along the main road grid can be seen as rather high, there are no iconic landmarks structuring the corridors and leading to an enhanced orientation. Although there are various possible gathering points along both main roads, the general quality of the built environment and missing landscaping elements have led to a rather limited amount of spaces, which can be immediately perceived as potential social spaces or areas for leisure activities. By observing the general backgrounds of users and visitors, social attributes were explored. It can be stated that the district lacks social inclusion and that certain areas are mainly inhabited by particular cultural groups due to the fact that labourers are accommodated by their sponsors. The ‘kafala’ system is rooted in both law and custom and establishes that entry for the purposes of work requires a local sponsor. This local sponsor is responsible for the accommodation of his labourers (Gardner et al. 2014, p. 7). As a result, many labour accommodations are shared by groups from the same cultural or ethnic backgrounds and according to a survey of Human Rights Watch (2012, p. 65) they are often reviewed as cramped and insufficient. Based on the fact that a large percentage of the migrant community only resides a limited period of time in Qatar based on short-term contracts, language communities have a direct impact on spatial practice and certain places have become the main meeting points for particular migrant groups. The lack of parks, sport grounds and sitting areas has however led to a very limited number of social activities, which are primarily reduced to exchanging news, trading, visiting barber shops, drinking tea as well as gathering around mosques after prayer times. In spite of the proximity to main tourist centres and cultural attractions, such as Souq Waqif and the Museum of Islamic Arts, hardly any tourists can be observed in the area. While there is a dominance of the male population in the district, a minor number of women and children were observed, who however avoided most areas and used roads as transitional spaces between homes and shops. The examination of the perceptual attributes included the degree to which urban spaces foster the users’ attachment to them while offering opportunities for an intensive human experience. Due to the state of deterioration and the general lack of landscaping as well as landmarks, most urban spaces can hardly be assessed as attractive environments fostering high levels of interaction and thus identification process between inhabitants and their surroundings. A main deficit in this respect is the general lack of urban spaces generating a certain degree of comfort and relaxation by being less exposed to traffic or being defined by certain urban design elements. While boundaries between more private residential and public areas along the two streets are defined to a certain extent, the general perception of urban safety suffers from hardly observed spaces within narrow side roads. Yet, the greatest potential can be found in areas, where historic buildings have remained. By and large, the overall scoring resulting from the application of the ‘Walking Tour’ assessment procedure reveals a high degree of inappropriateness in both streets (Table 1). However, while social attributes in the two streets have scored lowest among the three categories, functional attributes appear to be appropriate as evidenced in the compiled average scores. The movement and the social interaction of migrant communities was analysed in key sites along the two streets during weekdays as well as weekends and during afternoons and evenings. The sites were carefully chosen as an outcome of the ‘Walking Tour’ assessment procedure. Sites include both typical public thoroughfares as well as street corners offering small squares as public spaces. During weekday afternoons, it was observed that there is a certain tendency that small groups are gathering in certain spots waiting for their mates as well as for transportation pick up. These groups are typically male labourers from the Indian Subcontinent, who need to wait in certain areas in order to look for job opportunities. It was also observed that there is a higher concentration of movements along the main roads due to commercial activities. There have hardly been any reported tourist activities in spite of the proximity of various hotels and only very few locals, who mainly visit the area for certain shops and to look after their properties, have been observed. Women and children can hardly be seen along the two streets, which is a clear expression of a missing family-friendly environment in the district itself (Figs. 7, 8, 9). These observations correspond with the results of the ‘Walking Tour’ assessment procedure. 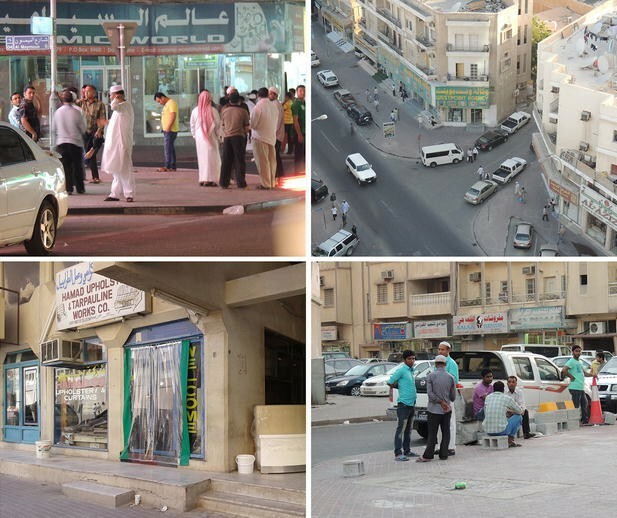 Spatial practice of migrant labourers in the Al Asmagh Street—various forms of space appropriation. 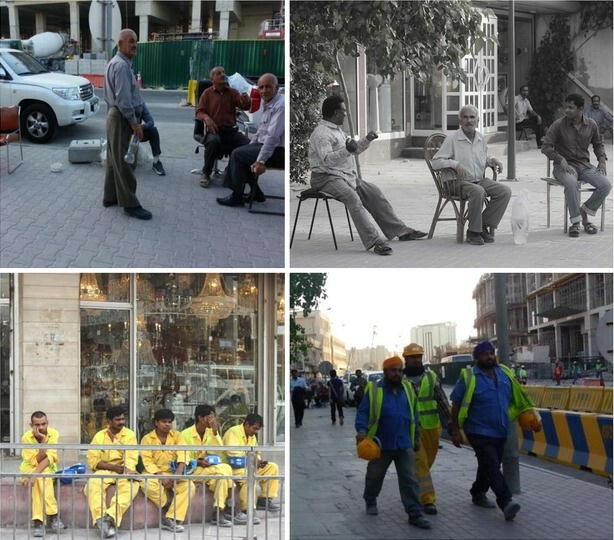 Spatial practice of migrant labourers in the Al Asmagh Street—utilising the sidewalk in various activities inlcuding gathering for social purposes. Towards the evenings the flow of people increases from different directions. Larger groups join for social interaction after their prayers in mosques. Due to limited living areas in residences, which are mainly used for sleeping, most labourers have adopted and appropriated their urban surroundings as an important space to socialise and to relax in spite of all spatial deficits. The proximity of the Msheireb construction sites has also resulted in crowds of construction workers waiting for their transportation during the evenings of the weekdays. Due to the lack of any purchasing power of these social groups shops along the main commercial roads hardly benefit from the new visitors. Their gathering in large groups has furthermore led to congested areas preventing efficient pedestrian movement and contributing to the particular circumstance of these urban spaces as neglected back-sided areas of the new mega projects along the coast. These perceived class spatial and class or social boundaries are particularly visible during evenings, when labourers come home to rest after a long day of work, gathering in street corners to socialise with friends and acquaintances. The exploration of the socio-spatial practice of migrant communities in the traditional core of Doha provides an excellent opportunity for students to learn about the history and profile of the city while understanding the unique particularities of issues relevant to environment-behaviour studies and the everyday urban environment including social interaction, appropriation, flexibility and adaptability. Nonetheless, the analysis and discussions offer important insights into planning and development efforts. Due to the fact that labourers, who are the large majority of residents in the Al Asmakh district, have limited access to shopping malls and high profile public spaces, the neighbourhood’s surroundings have thus become the main public realm for any interaction and thus both individual and collective spatial experience. The high concentration of social interaction during weekends has led to the survival of many small businesses and services catering to various cultural groups based on the relative high level of land-use integration and low rental rates in deteriorating buildings. The overcrowded area and the resulting lack of private spaces have however transformed the Al Asmakh district into a highly conflicted urban setting. While in the past, key areas, such as Souq Najada, were important nodal points for social interaction of residents in a very suitable public environment (Samahy and Hutzell 2014), the rising investment interests have led to a gradual replacement of these areas by launching hotels and other commercial developments to benefit from the proximity to Souq Waqif and the waterfront promenade. In essence, two opposed urban spaces are currently facing each other, which can be particularly observed in the case of the Al Asmakh district. While on the one hand, new mega projects generate globalised images appealing to investors and tourists, the bordering historic districts have first become a place of refuge for a large figure of labourers migrating to Qatar during a short period of time leading to highly overcrowded, informal and fragmented spatial urban conditions (Wiedmann et al. 2013). In very recent years, these districts themselves have become objects of investment interests leading to a new era of potential gentrification in Doha’s central areas and a subsequent move of migrant communities from areas they managed to spatially appropriate for their needs. The Msheireb development site can thus be seen as the clear antithesis to the neighbouring Al Asmakh district and all remaining historic urban spaces in downtown areas (Salama 2014b). The new top-down master planned project proposed for the redevelopment of the Al Asmakh will create state-of-the-art urban environments with high rental prices and for social groups with profiles dramatically different from those of current migrant labourers. While the proposal considers the preservation of key traditional houses, it may result in eliminating an important chapter of the city’s history. It is anticipated that when higher income groups move into the newly developed project they will hardly interact with neighbouring districts, if no major public interventions were created to support interaction and safety. Therefore, the move of new social groups to central areas has to be seen as a major opportunity to foster social interaction and to strengthen the small local businesses. Nonetheless, this can only be achieved with sensitive and gradual upgrading processes and a high level of integrated affordable housing for lower income groups. The major planning challenge of creating sustainable city centres in Gulf cities is rooted in the inner investment dynamics, which have led to a rapid increase of land prices in central areas and thus a continuous tension between speculators keeping their land and deteriorating properties on the one hand and new government-supported initiatives targeting short-term gains on the other. New planning regulations keep facing an increasing struggle to accommodate the high demands of enhanced built densities and the reality of missing infrastructural capacities on the ground. The fragmented development of large-scale projects has contributed to an urban environment that lacks spatial cohesion and integration. The newly launched waterfront developments along the historic centres have thus triggered a quite complex situation between establishing new spatial realities during a short period of time by a small number of mega projects and the spatial results of decades of urban development driven by the general segregation between the residential areas for migrants and locals. Therefore, new planning regulations should cultivate a sense of social inclusion rather than a fragmented agglomeration of segregated communities. The previous low standard of infrastructure, the initial lack of accessibility due to narrow roads and the high demand for housing have early transformed historic cores of Gulf cities and their surrounding districts as main residential areas for migrants. Subsequently, the central districts have therefore accommodated a significant share of migrant labourers. This has led to spatial urban conditions that reflect various needs as well as the limited purchasing power and thus restricted economic growth thereby leading to a gradual deterioration of the built environment. The rapid replacement of traditional areas will unavoidably lead to new mass housing areas in the urban periphery, which will hardly accommodate the high diversity of needs of migrant communities for affordable price tags. The relocated communities will find themselves in a challenging newly built environment missing the long-term attachment. While the spatial conditions and deteriorating buildings in districts, such as Al Asmakh, have permitted a certain level of informal adaptation of urban spaces, the newly developed housing projects and their surroundings on the peripheries and industrial areas hardly enable the individual spatial appropriation of migrant groups. Thus, contemporary urban planning in the Gulf region has to respond to the emerging conflicting perceptions and values in historic centres, which are being envisioned and planned as mixed-use downtowns and new main hubs for services. Urban space diversity is however highly dependent on social inclusion and in turn the potential of various social groups to interact. The mediation between short-term investment interests and long-term community-driven development patterns is particularly challenging in the Gulf region due to the evident contrast between the small minority of locals and the large majority of migrants with limited prospects to stay long-term. Urban spaces are consequently a direct expression of the core problem of today’s Gulf cities as being the result of large-scale investments and top-down strategies with hardly any demand-driven dynamics. The gradual replacement of inner city districts will erase the last remaining urban spaces that will become as part of a collective memory rather than actual physical environment. Urban space diversity is seen worldwide as a precondition to overcome boundaries and it is particularly challenging to establish in fast growing emerging cities (Fainstein 2005). The rapid globalisation of the Gulf region has recently led to various rising conflicts between preserving the local identity and enabling the accommodation of migrant communities according to their needs as well as cultural preferences (Fox et al. 2006). It should be emphasised that master planners and decision-makers in multicultural cities need to adopt a high level of responsiveness to envision urban spaces attract instead of alienate the various migrant groups (Sanderock, 1998). In this respect, the investment in state-of-the-art public spaces along mixed-use streets can play an important role in establishing more sustainable communities by enhancing the economic dimension and by promoting a continuous exchange between social groups (Peter Jones et al. 2007). While authorities, such as Qatar’s General Secretariat of Development Planning (2009), have launched various programs to foster more sustainable communities, the major focus has remained on the native population (GSDP 2009). The indecisiveness of officially integrating migrant communities on the long-term has led to the spatial reality of segregated communities and parallel worlds. The gentrification of historic city cores via large scale mega projects will only lead to the relocation of the problem of social segregation with potentially more social, economic and environmental risks attached. Many examples worldwide suggest that new settlements along the urban periphery deprive large communities from the essential spatial needs, namely the high level of accessibility and direct contact to higher income groups in order to develop small businesses and thus to enable the opportunities of individual advancement. Subsequently, central districts, such as Al Asmakh in Doha, are key urban spaces to establish and nurture both social and spatial justice. It is hoped that the parts of old Doha which remain, such as the neighbourhoods of Al-Asmakh and Al-Najada which accommodate low-income groups, particularly labourers, are also treated as important place typologies that shaped the memory and history of the city. While demolition and eviction notices have been issued for around half the buildings in the Al-Asmakh area, recent professional and academic debates may offer possibilities for fulfilling this hope (Salama 2014b). Future aspirational change in Doha’s old centre could then be based not only on top-down decisions but also via initiatives generated by interest groups or the local community, employing bottom-up strategies. AS conceived of the study, participated in developing and validating the methodology, and delivered and supervised the application of the experimental design. He also contributed to drafting, reviewing, and editing the manuscript. SA contributed to the literature review, participated in the development of the research tools and supervised the implementation process. FW participated in the development of the paper and in writing analytical descriptions about the research outcomes. He also offered analytical reflections on drawing conclusions and in establishing future projections. All authors read and approved the final manuscript. Key components of this paper are developed based on an earlier comprehensive funded research project of the National Priorities Research Program, QNRF-Qatar National Research Fund (NPRP 09-1083-6–023). Thanks are due to the class groups of ARCT 420: Environment-Behaviour Studies, delivered as part of the professional five year program in architecture, Department of Architecture and Urban Planning, Qatar University. In particular we acknowledge the work of Al Amira Ebtissam Al Bash, Areej Radwan, Hadeel Saleh, Heba El-Gahani, Kholoud Soliman, Sania Fatima, Sara Abdulrahman. The authors acknowledge the resources offered through the leadership fund of the Department of Architecture at the University of Strathclyde toward developing this work.